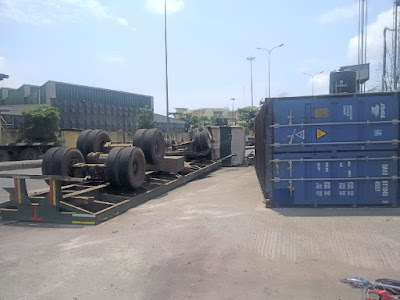 The surveillance team constituted by personnel of the Safety Department, Western Ports of the NPA is to renew efforts at ridding the ports of substandard trucks. In a statement in Lagos, the General Manager, Public Affairs of the NPA, Capt. Iheanacho Ebubeogwu said members of the team were drawn from the Western Ports Headquarters, Lagos Ports Complex (LPC) and Tin Can Island Port Complex (TCIPC). He said the team was now involved in the physical inspection of trucks; to ensure that only trucks that complied with stipulated safety standards gained access into the ports within the Lagos area. Leader of the team, Engr. David Adeola said the work of the team had started yielding positive results as a number of trucks were daily prevented from entering the LPC due to their poor road worthiness. According to the statement, Adeola was optimistic cases of frequent accidents involving trucks within and outside the ports would be curtailed if the truck operators complied with the minimum standards of truck road worthiness. He said the minimum standard of truck road worthiness for admittance into the port stipulates specifications expected of a truck to include the truck head, body, braking system, engine, battery, trafficators, warning devices, twist locks and other fittings. Chairman, Association of Maritime Transport Owners (AMATO) Chief Remi Ogungbemi said his association was in full support of the surveillance duties of the NPA to ensure the safety of other road users in and outside the Port. Ogungbemi said the enforcement of the safety standard was necessary for all trucks operating in the ports nationwide. He disclosed that his a association was already educating its members on the benefits of acquiring and havingstandard trucks for their operations. The Assistant General Manager, Security (Western Ports) Mr Sam Asamaige said some truck owners were already complying with the required standards for trucks to operate in the ports.